Remember: “On-Page” or “On-Site” SEO refers to search engine optimization strategies and best practices that are done within specific pages or an entire website, respectively, to increase search engine rankings. How Does It Work Within Search Engine Results? For search engine results, the title tag is used as a primary factor in determining what your page is about and is displayed in organic search results, other websites – such as social media sites – and within your web browser at the top and within the tabs. 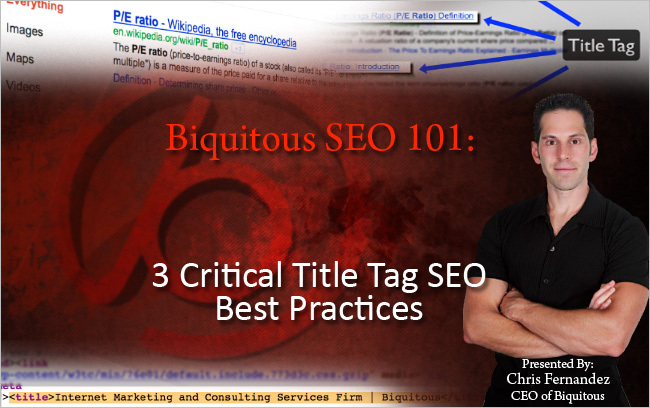 Why is the title tag vital to your company’s Internet marketing strategy? First, it’s the title or headline of your article, blog post or web page, and is the very first thing that people see in search results, or when scanning a page for headlines or something to click on. 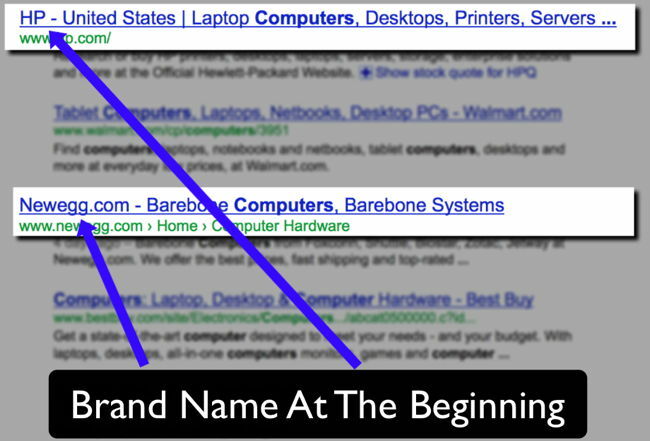 Second, search engines like Google and Bing place a heavy emphasis on the title tag for ranking your page. Third, a catchy, keyword rich headline attracts more links from other websites all on its own because of the fact that, if the headline was compelling enough for the reader to click on it (and the content on the page backed that up) then you are more likely to get a friendly retweet, Facebook post, or backlink to your article passing it along to others. So in short, a compelling headline (aka: the title tag, or title) not only speaks to search engines in a language they can understand, but it also is the #1 factor for visitors in deciding whether or not they want to click through and visit your website, and ultimately, whether or not they want to link to your website and share your content with others. Once your title tag is in place and compels a user to click on it, if your content then backs up that promise, that great headline will increase the chances that your content get shared with others. 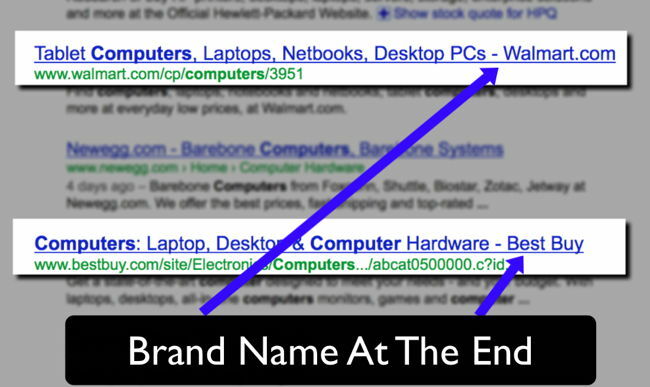 How do you create amazing title tags and what are some best practices for humans and search engines? Make sure you write the title tag for human beings first. Why? 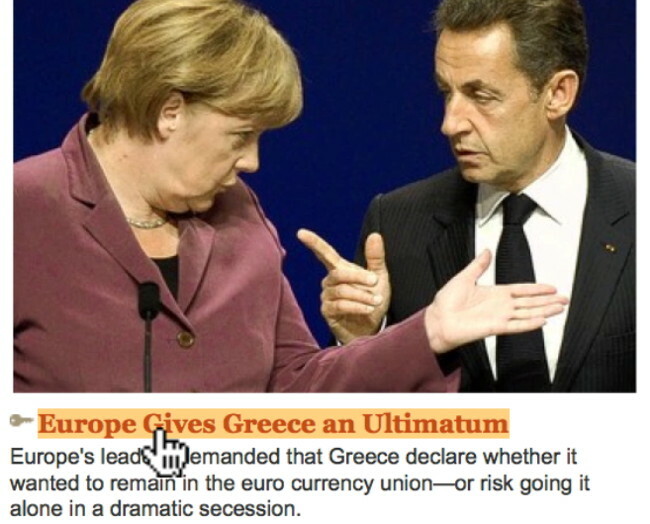 It does you no good to craft a fancy keyword-rich headline if nobody clicks on it. The headline should be compelling and descriptive telling the visitor exactly what that page/article is about in as few words as possible. Think along the lines of writing a newspaper headline: You want to GRAB me and make me want to click on your link, especially if I’m interested in that topic or in need of your product or service, and I’m your target audience. Remember: Humans First! 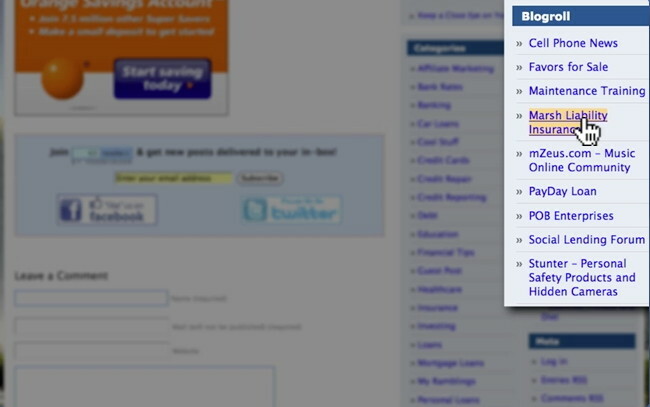 Make your title tag read like a newspaper headline to attract attention and clicks! so that the article has a better chance of being found, ranking, and converting for your desired content/keywords on that page. While beyond the scope of this piece (I’ll post something soon on exactly how to do this) make sure you at least use Google’s Keyword Tool (free) or the SEOMoz Keyword Difficulty Tool (requires subscription) to find appropriate keywords for your title tags based on traffic and competition. Now that you’ve put a little time and thought into your title tag, it’s time to fine-tune your title with some final best practices and strategies for usability and the SEO side of things. Title tag character limit: Make sure your title tags are less than 70 characters in length, including spaces, because that is all that that will be displayed in search engine results. Your title tag can be as long as you want it (and sometimes will need to be longer than 70 characters out of necessity) but try your best to keep it under this limit. Most important keywords at the beginning: Try to always put your most important keywords/phrases at the BEGINNING of your title tag. For stylistic and human reading purposes, this might be hard or difficult to do with certain pages/posts, but as a general rule, the search engines give more weight to words at the beginning than at the end of the title tag when ranking your pages. Branding: As a general rule of thumb, you should include your website/company name in your title tag either at the beginning on your homepage, or at the end of your title tag on all other pages and blog posts separated with a pipe (|). However, we’ve done it both ways depending on whether a brand is well known or not. In other words, if it is well known, putting the website or company name at the beginning, regardless of the page, can help with click-through rates because of trust and authority. If your company is well known and has a powerful brand, it might help click-through rates to put your brand name at the beginning of your title tag. Of course sometimes, even well known brands still put their company name at the end of their title tags. Unique title tag for ALL pages: Make sure that you have a unique title tag for each page of your website! Sounds trivial, but you’d be surprised how many websites – especially well-established businesses and brands – have duplicate title tags! This is a big no-no. Keyword stuffing: Don’t think that adding MORE keywords is better. It’s ok to try and rank for a broad phrase that contains a couple of like-minded or similar keywords, but if you overdo it, you will get penalized. For something as important and simple as your title tag, it’s not worth the risk! 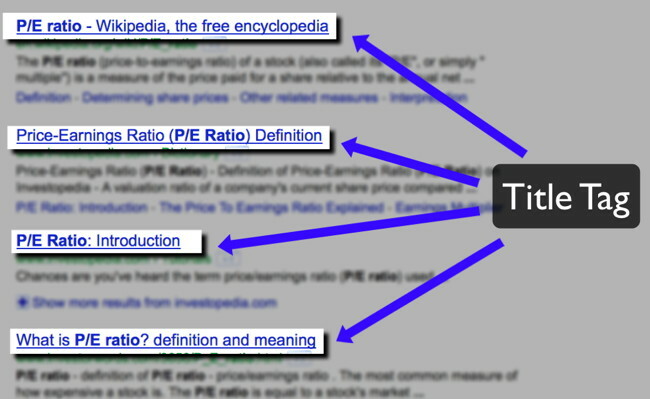 The title tag is easy to understand and simple to execute making it one of my favorite starting points for beginning or fixing a company’s SEO strategy. By utilizing these best practices and examples, you can quickly and easily see where your company has perhaps gone astray with your SEO and, while it might take some time depending on the size of your site, the investment is well worth making sure that your title tags are the best they can be for both humans and search engines. If you’ve got anything to add that you think I missed or is vital (I tried to be concise and direct without going into minutiae) please leave a comment below.